At Cell Therapy Sciences we harness the regenerative properties of mesenchymal stem cells to prepare clinical therapies for dogs and horses. Based on our own research, we have optimised these therapies to ensure you receive the very best cells for your patients. From a small piece of an animal's own tissue, many millions of regenerative cells can be grown by culture-expansion in our specialised VMD-authorised laboratory. We have developed our own, evidence-based procedures for harvest, implantation and transportation, which are simple and practical for vets - and ensure the highest possible standards of safety and quality for pets. Culture-expanded, mesenchymal stem cells (MSCs) have been used to treat lameness, pain and degenerative joint problems in dogs and horses for more than 10 years. The most recent clinical evidence includes a number of significant, well controlled and large clinical investigations into canine OA (e.g. Shah et al 2018; Harman et al 2016) with authors reporting that MSCs can not only reduce pain and inflammation, but also improve quality of life and enhance tissue repair. The World Small Animal Veterinary Association recognises stem cells in their pain management protocol and include stem cell injections for DJD in dogs and cats in their Pain Council Guidelines. Why use our culture-expanded stem cells? We are the most experienced companion animal stem cell laboratory in the UK, having prepared > 2,000 stem cell treatments for intra-articular and intravenous use in client-owned dogs and cats. We conduct our own laboratory research and have ongoing scientific collaborations with leading stem cell centres, including University College London, Stem Cells Scotland and Coventry University. Four clinical investigations to date in moderate to severe canine OA have reported significant reductions in pain and improvements in functional mobility following intra-articular injections using our stem cell preparations. These include the first reported study to use two validated arthritis questionnaires to evaluate clinical outcomes in OA (Armitage et al 2018). Our VMD-authorised cryogenic storage and transport system maximises stem cell quality and viability at point of care and has been shown to be superior to shipping at ambient temperatures. Stem Cells for your Pets? At Cell Therapy Sciences we have prepared more than 2,000 stem cell treatments for pets across the UK. please see our "published evidence" and "Case studies and Gallery" pages. Watch our video below to find out how we do this - and to meet a few of these cases. Take a peek at Keeva and Erin's brave and beautiful story. Many thanks to their mum for producing this lovely short film. 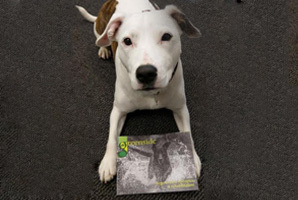 Greenside Regenerative Therapies and Rehabilitation Centre was the FIRST regenerative medicine veterinary hospital established in the UK, bringing together stem cell treatments and other regenerative medicine technology with state of the art diagnostic and rehabilition expertise. Keep up to date with their exciting research and success stories here! Recognising signs that a dog is experiencing pain due to arthritis is very difficult; they are masters at hiding their pain. The only signs we may see is that they are slowing down or stiffening up. This poignant video from CAM reminds us we need to better understand and recognise pain if we are to improve and extend the lives of our pets suffering from arthritis. CAM have developed a range of services to help pet-owners and vets to improve the quality of life in OA. Have a question? or simply interested to know a little more about what we are working on and what we can do to help you, please call us for a chat.